US #86 – The 1868 Franklin “E” Grill. Click the image to buy. In early 1775, Paine began working as editor of the Pennsylvania Magazine. Later that year, he began writing Common Sense, under the working title Plain Truth. 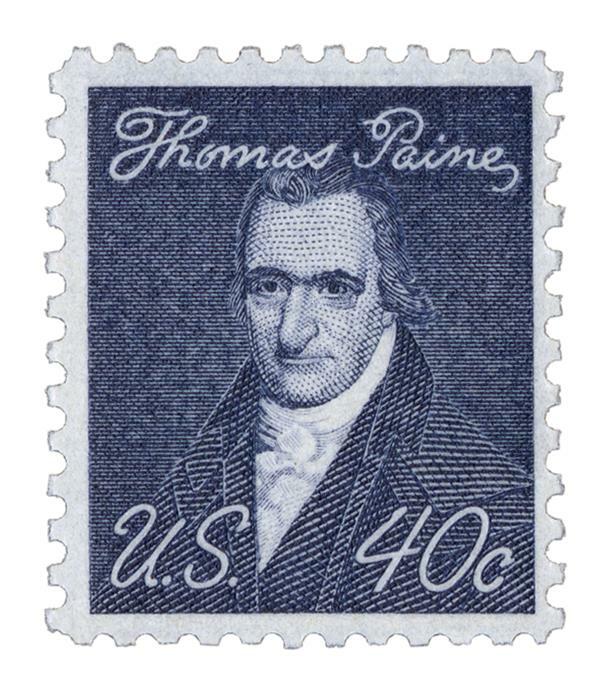 Initially, Paine planned to publish his ideas as a series of letters in different Philadelphia newspapers, but it became too large of a project. Unsure of what to do, Paine consulted Benjamin Rush, who suggested he take his pamphlet to published Robert Bell to print. Rush knew that some printers might take issue with the revolutionary ideas, but that Bell wouldn’t give him any issues. In fact, Bell was excited by the pamphlet and published it happily. He also promoted it in several Philadelphia newspapers. 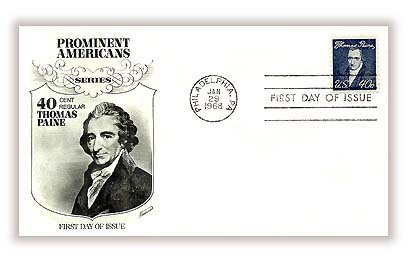 US #1292 FDC – 1968 Paine First Day Cover. Click the image to buy. 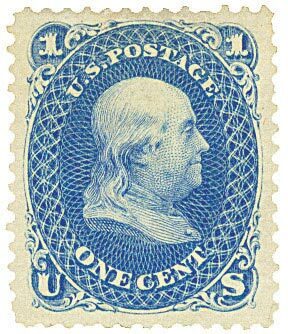 US #72 – The highest denomination stamp issued during the Civil War. Click the image to buy. Paine served as a soldier in 1776, and in April 1777, became secretary to the Congressional Committee of Foreign Affairs. He went on to champion liberty and reform in England, which earned him the charge of treason. Paine was departing from the country as the charges were filed and then participated in the French Revolution, which earned him 10 months in prison. 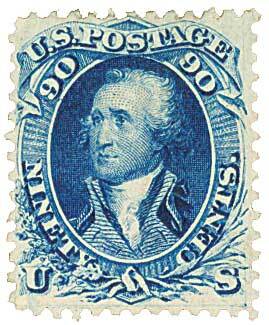 Paine returned to the United States in 1802, and died in New Rochelle, New York. 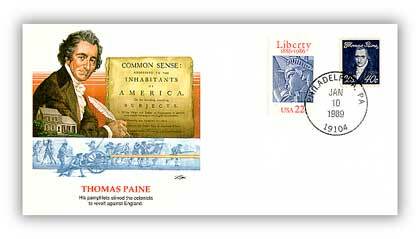 Item #81917 – Commemorative cover marking the 213th anniversary of Common Sense. Click the image to buy. 13 Responses to "This Day in History… January 10, 1776"
Based on today’s troubles with Mr. Trump and the WH, based people should read the pamphlet again. Dam the Wall! Put America back to work! Disagree! Living in Arizona I see first hand the affects of not having a physical barrier on the southern border (ask a border patrol or ICE agent…they live it, they know). President Trump (not Mr. Trump), HAS put America back to work with the policies he has put in place (much to the chagrin on the left). I agree the manner in which THE PRESIDENT does things is not exactly presidential, but on the issue of the physical barrier on the southern border, I can’t see why people can’t see it’s necessity. Walls may be effective back in the Middle Ages; however, in this day and age there are numerous ways to circumvent a wall. While our infrastructure is in tatters, not only is it expensive to build that wall on our southern border but also expensive to maintain it! We just need better oversight to protect our borders on land and in sea. Based on the article above by Mystic, we need to read Common Sense of Thomas Paine again! Come on, Dennis…”not exactly presidential?” Trump is an uninformed, serial lying, buffoon who is in way over his head. A “physical barrier on the southern border?” That won’t stop drugs, criminals, or terrorists. It would be a $5.5 billion boondoggle and a monument to Trump’s egomania. To Conrad Gaunt: It saddens me that there are so many American like you, who obviously do not understand what this country is all about, how it came to be, and the principles upon which it exists – as clearly stated by this country’s Founding Fathers, and enumerated in our Constitution, as amended by the Bill of Rights. I fear for the future of this country, because there are so many “citizens” of the USA who are uninformed, uneducated, and completely ignorant about our Country. I especially refer to those who blindly, and without thinking, allow their hatred and bias against this President to undermine, and potentially destroy this wonderful Nation. Another bleeding heart reply. President Trump is trying to do what a President of the U.S.A. is supposed to do and that’s to protect our country and our citizens. This is a sovereign naton and we need to protect our borders for illegal aliens. This country cannot afford welfare and healthcare for millions of illegals !! Take care of our citizens!! To Charles and Norman: President Warren Harding (of all people) coined a word to your kind of words…to “bloviate,” A sort of rough definition is to utter or write a lot of words without actually saying anything. Congratulations on providing a couple of examples. It just makes sense. Common sense. Canada has requested a northern wall,but it must be well tended with attractive shrubbery. No matter your current political position on the issues of the day you will agree with Paine’s words from his other series of pamphlets “The American Crisis”. His words are as valuable and relevant today as they were in 1776; “These are the times that try men’s souls”. Excellent story! I always thought of Thomas Paine as a propaganda writer. But I know there was truth in what he wrote. The leaders in the American Revolution were very courageous. They risked all they owned and the well being of themselves and families for freedom. I should buy the book and read it. Thank you Mystic, and thanks for the both interesting and humorous comments. I have yest to read this. But recently I read a book on ‘Banjamin Rush’ that referred to Paine’s book and how well it was received during those historic times. Yes I agree there are ways to solve today’s problems with common sense rather than lies. Would be nice if commentary excluded references to Trump and current politics. So tired.